Here's the hidden truth behind the "Xiaomi Redmi Note 5 Pro available for Rs 5,799" offer during Flipkart Big Shopping Days sale. Xiaomi smartphones receiving generous discounts are not uncommon in India. Either the manufacturer or Flipkart makes sure buyers get maximum value for money from their purchase of a Xiaomi smartphone. As a part of Flipkart Big Shopping Days sale, massive discount one of the most popular Redmi-series smartphones is trending extensively. 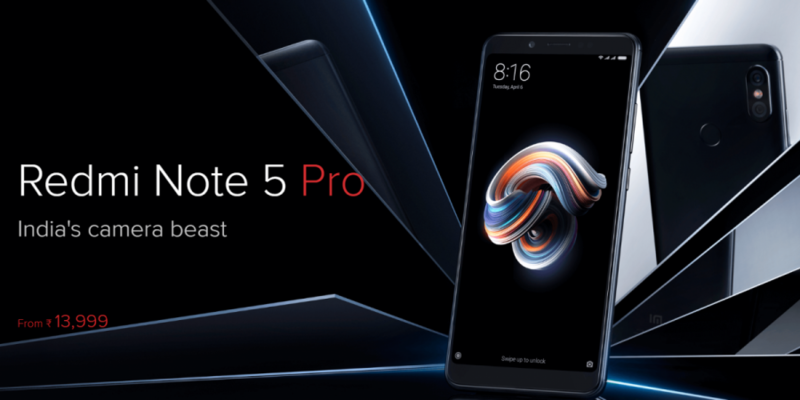 Xiaomi Redmi Note 6 Pro might be the hot top right now, but its predecessor Redmi Note 5 Pro is not the one to be forgotten. The ongoing Flipkart sale is offering a discount along with some bundled offers on the Redmi Note 5 Pro, which makes the handset available for as low as Rs 5,799. This sounds incredible as the discount is more than half of the device's actual cost. Xiaomi Redmi Note 5 Pro is normally available for Rs 14,999 for the 4GB + 64GB model. During the Flipkart Big Shopping Days sale, which concludes on December 8, there's a flat Rs 2,000 off to get the phone's cost down to Rs 12,999. This is a limited period offer and a decent one at that. But what about the Rs 5,799 offer price, you might ask. Well, the offer does sound compelling but it is not without a catch. Let us break down the offer for you. Xiaomi Redmi Note 5 Pro can be bought for Rs 12,999 without any catch. But to get the price down to Rs 5,799, buyers must avail Flipkart's exchange offer. So we went ahead and investigated if the exchange offer is good enough for customers to avail it. When a customer clicks on "Buy with exchange" option on Flipkart's Redmi Note 5 Pro listing, buyers can choose from a list of smartphones that needs to be traded in. We picked some of the most popular smartphones from the exchange offer list to see the exchange value. To our surprise, the iPhone 6S Plus offers an exchange discount of Rs 5,050, Google Pixel XL gets Rs 4,900, Honor View 10 could fetch Rs 5,650, OnePlus 6 offers Rs 6,900 exchange discount and Samsung Galaxy S7 Edge gets Rs 5,700 off on exchange. By our estimates, buyers can get much higher value for these models by selling them elsewhere, such as on OLX or Quikr. But what baffles us is beside offering such low discounts on an exchange, why would anyone wish to downgrade from a higher-end phone to Redmi Note 5 Pro. For instance, it doesn't make sense to trade in OnePlus 6 even for a brand new Xiaomi Redmi Note 5 Pro. Same goes for Pixel XL and iPhone 6S Plus. That's not it. We've seen Flipkart offer better exchange discounts on older phones in the past. So even by Flipkart's standards, these offers aren't the best. So if you're considering buying the Redmi Note 5 Pro for Rs 5,799, there's little to no reason how this deal would be profitable to you. Buyers would benefit from availing the Rs 2,000 flat discount, 10 percent instant discount with HDFC Bank cards, EMI offers and giving the exchange offer a miss.